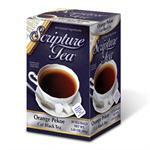 Let our rich, quality teas warm your spirit and the Bible verses soothe your soul. *A different Bible verse on each tea tag, and each tea bag is individually wrapped. Bulk options are available. *Great gift item for others or just treating yourself. *Our individually wrapped tea bags and beautiful boxes can be used at church events and other various events, such as Christmas Teas, Mother's Day Teas, Spring Teas, Bible studies and small groups, conferences, fundraisers. Can be used as door prizes, served at the event, part of event favor bags, etc. *Wedding, bridal shower, and baby shower favors. Call us at 407-656-1004 to discuss your event and how to make Scripture Tea a special part of it. *Shipping Note: Please allow 5 business days (Monday- Friday) of processing time on top of the shipping time for an order. It typically does not take that long, but we ask that you add the processing time to allow proper order timing and planning, especially if this is for an event or occasion. However, if you have an event that requires a quicker processing time please do not place your order online, but call 407-656-1004 and we will be happy to try to expedite your order. **20 INDIVIDUALLY WRAPPED TEABAGS PER BOX.